Michael and Gabriel Bell describe sword-making. 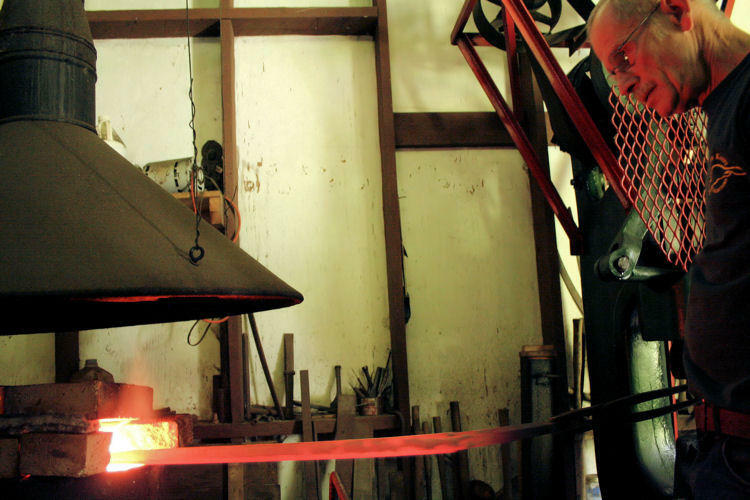 The Japanese-style swords turned out by Dragonfly Forge in Coquille are so authentic (and expensive) that the makers turned down the chance to make swords for "The Last Samurai" for free. Michael Bell working hot steel. Father Michael Bell and son Gabriel are the dedicated swordsmiths of Dragonfly, using techniques that predate them by centuries. And people not only pay handsomely for custom swords, they pay for lessons in how to make their own. The Bells pay us a visit to talk about their craft. Stephen Bacon and Morgan O'Shaughnessey talk about and play the instruments. Lots of us pick up old guitars and other musical instruments at yard sales and antique stores. But the Schuman family took the pursuit seriously. The result is the Schuman Collection of musical instruments, a large cache of instruments from several centuries and many places around the world. Stephen Bacon of Bellwood Violin in Ashland is the appointed conservator of the collection.